The "Take It!" 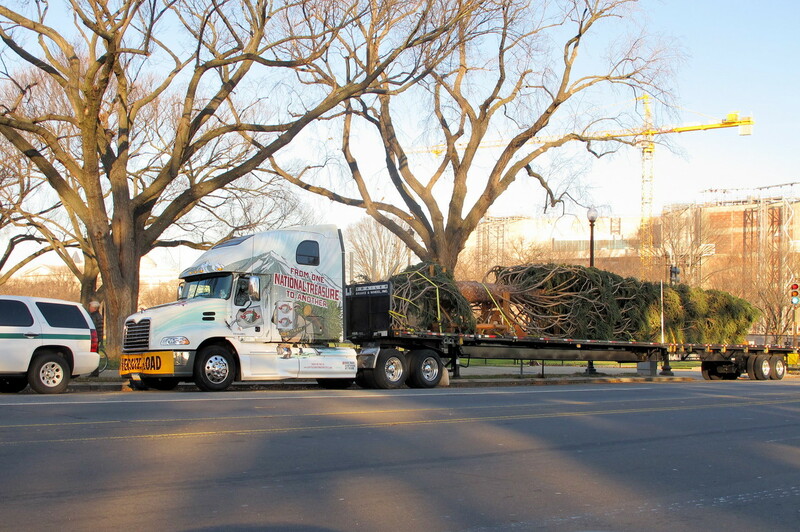 came from passing this truck and seeing the National Christmas Tree in a holding position having recently arrived with its grand cargo. I almost did a pass by of it but decided to turn around and get some close up shots to share. The After Take: All whom I showed this series to were happy to see this project in the works of coming to being. 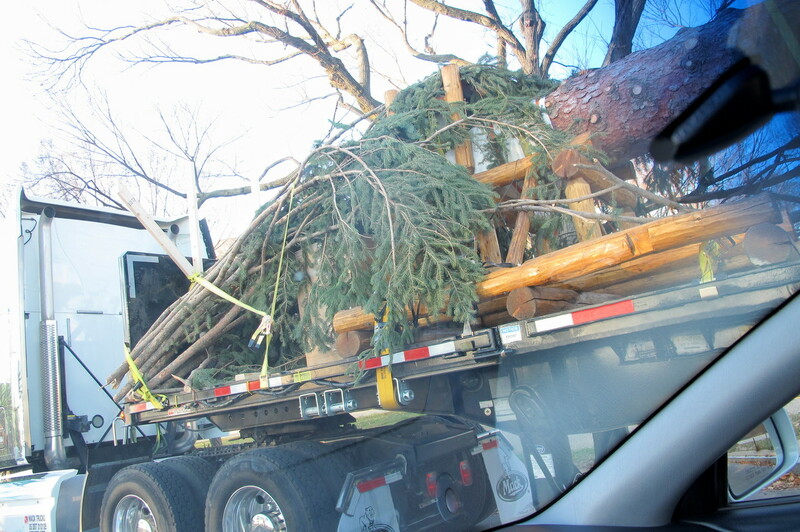 I was facinated with seeing the extra bows that had been loaded onto the truck and placed at the base of the trunk of the tree. 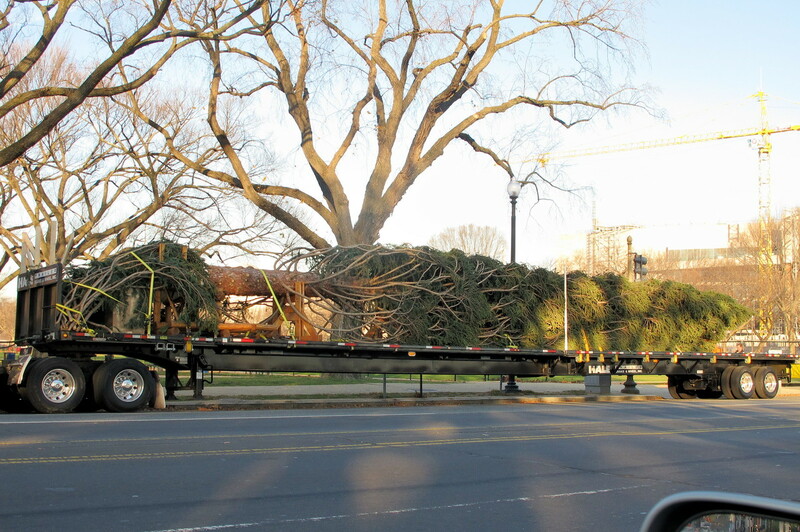 I could only surmise that they were too thick to bend into the trunk as were the smaller branches (just like they wrap a tree to put it on top of ones car at a local Christmas Tree lot.) I am guessing that they use these branches if necessary to fill out the bottom of the tree. The morning of this photo was bright and clear. The few people that were around the tree were excited in seeing it even though some of them were those who were coordinating the next moves for this treasure that had come all the way from Colorado. The tree is now up and decorated and standing in its place of honor for all to see. Here is hoping you enjoyed as much as I did this peek at some of what happened to bring about this great show. Thanks for joining us for the current photo presentation. You are cordially invited to return Friday, January 18th for a new picture that we hope you will enjoy. This is one of those things that you never really contemplate. At least not me. How the tree got there. In my home town we have a very large tree outside city hall during Christmas. I have never wondered how its setup process went. I'm sure it was in a similar fashion to this one, and this has now peaked my curiosity. Unfortunately I have to wait a year to find out. I complained about putting up my tree this year. This kind of puts that into perspective. Ha!